Bringing together enterprising young people and St. Louis' most promising startups and growth companies. The Morning Showcase will be for companies seeking full-time employees and contractors for various positions, both technical and non-technical. Job seekers with technical skills and/or previous startup experience are encouraged to register. The Afternoon Showcase will be for companies seeking interns and current college students seeking Spring & Summer internships in St. Louis. Ever consider starting your own business or becoming an executive at a firm? You'll need experience, and the right kind. Here's your chance to work at a startup, alongside a more experienced entrepreneur. Most entrepreneurs will tell you that the team around them makes all the difference in the world. They're looking for smart, energetic people who can provide value from day one - sell, design, grow, improve a product or process, ensure customer success, and help drive the business forward. St. Louis' startup ecosystem is burgeoning with many promising young companies. Incumbent corporations need access to on-demand innovation and are also seeking entrepreneurial minds who can help their businesses stay ahead of the curve in their respective industries. Are you ready to start building and commit to extending our economic frontier? Identifying high-quality, motivated job candidates as you build your teams can be a grueling process. How would you like to spend one day meeting a selected, pre-vetted, group of young people who want to work at a startup? The Startup Talent Showcase is not your typical career fair. We recruit and assemble a line-up of eager students and new graduates who pitch to you for a startup job. Candidates will be seeking summer internships and full-time opportunities. Through our partnership with PluggedIn, we'll be powering the job fair through its talent matchmaking platform designed just for startups and large firms with innovation arms. Sign up today to start connecting to a new pipeline of talent! Job seekers: College students and recent graduates who want to learn and contribute to an innovative company. Companies: Startups, growth firms and corporates with internal incubators, M&A or innovation entities. Connect. Build. Create Value. Make Your Mark. Meet St. Louis' most promising, cutting-edge startup and growth companies representing an array of industries. Get to know corporate firms and learn about internal incubators, innovation and M&A divisions, and rotational programs. HOW IS THE SHOWCASE DIFFERENT FROM YOUR USUAL JOB FAIR? This event is run in a pitch format. 2) Each job seeker will have one minute to pitch to companies. Companies will have a roster of job seeker participants to follow-up with candidates post-showcase. 3) The matchmaking process begins. This is where the magic happens. You don't have to move to Silicon Valley or New York to join a startup. Each region throughout the country has a different set of strengths and defining institutions. St. Louis is an innovation hub made up of startup companies tackling all kinds of problems across industries including AgTech, FinTech, Cybersecurity, Digital Healthcare and Biotechnology. Not to mention, St. Louis most recently became the Geospatial Tech capital of the world. The Morning Showcase will be for companies seeking full-time employees for junior level positions and new/recent college graduates (1-3 years) seeking full-time or contract/freelance positions. The Afternoon Showcase will be for companies seeking students for Spring/Summer internships and current college students seeking Spring & Summer internships in St. Louis. The Morning Showcase will be for companies seeking full-time employees for junior level positions and recent college graduates seeking full-time or contract positions. The Afternoon Showcase will be for companies seeking students for Spring/Summer internships and current college students seeking internships with a St. Louis company. 10:00 - 10:30: Companies introduce themselves to job candidates via one-minute pitch. Companies introduce themselves to students via one-minute pitches. Students have one-minute to pitch to companies for an internship. 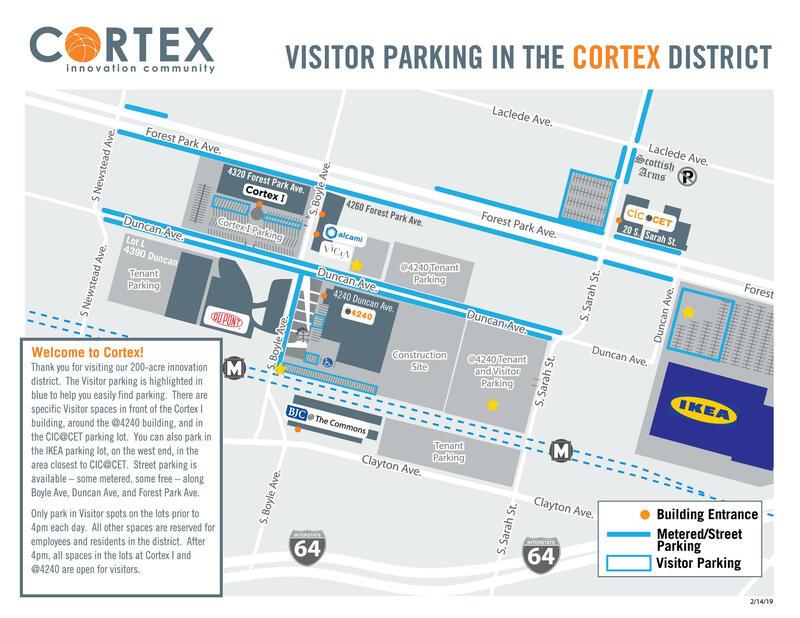 Parking is available in select parking lots throughout the Cortex district. Pay attention to the lots on the map. You are going to the @4240 Building (4240 Duncan Ave, 63110), with the big @ symbol on top. 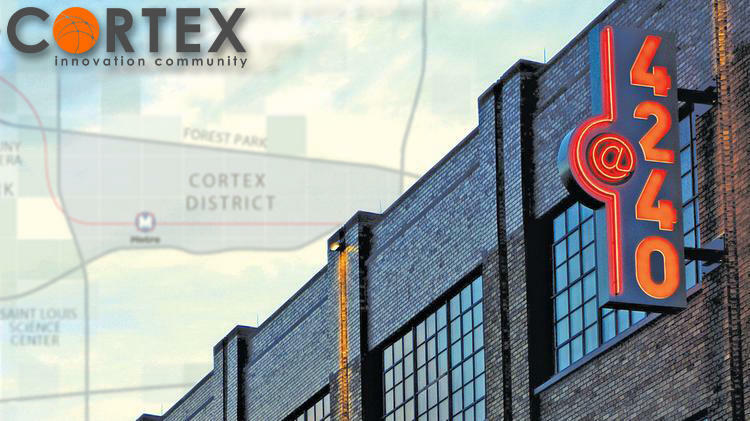 * In the gravel lot across from @4240, entering from Duncan Ave. You’ll notice the “Event Parking” signs at the entrance. Tell the attendant that you are attending the Talent Showcase. * In the S. Sarah Street lot, entering near the intersection of Duncan Ave and S. Sarah Street. As you enter the lot, take a ticket. You may park in ANY space, not just the ones marked for visitors. There is an hourly charge, with a $6 maximum for the day. You must pay by credit card at the gate as you exist. *In the IKEA parking lot. Really! If all other parking is full, please continue east on Duncan Ave and enter the IKEA parking lot. Park in any available space. This is a busy area, so give yourself enough time to park and walk to the building entrance.